From a student’s point of view, a competency-based education model offers you the opportunity to put your past experience, skills, and knowledge to good use by allowing you to prove, through continual, real-time assessments, what you already know. With a competency-based educator, there’s no reason to waste three months in an introductory college class when if you already know the subject. 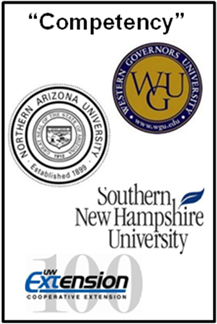 When you plan on getting your degree from a competency-based education provider like WGU (Western Governors University) or SNHU (Southern New Hampshire University), you can move rapidly through material you already know by taking exams when you are ready, and slowing down as necessary when you encounter new or more challenging information. With StraighterLine as your starting point, and a college or university that offers competency-based education as your end point, you can get your degree on your own terms. School to win the approval of the U.S. Department of Education for offering direct assessments of learning without a connection to credit hours and also be eligible for federal financial aid programs. But SNHU was just the first of a wave of schools that are including this model in their offerings. Many of StraighterLine’s partner schools are offering their own brand of competency-based learning. Capella University is cited in the Inside Higher Ed article, but Western Governors University is a leader in this area and should have been. The University of Wisconsin Extension, which has been offering continuing education to adult learners and other non-traditional students for 100 years, allows students to pursue a self-paced, competency-based degree. They have transformed 25 of their general education courses from 15 departments to their new competency-based education model. So What Do Southern New Hampshire University, WGU and UW Extension Know That Other Schools Don’t? In short, they understand that higher education is changing. Non-traditional students are becoming an increasingly large percentage of the entire student population. They are going to school while they are working and raising families. They are home schooling and looking for different options when they move on to higher education. They are going to school later in life, and bringing with them experiences that should be recognized as valid sources of knowledge. And they are taking MOOCs and other courses from a wide variety of providers, but still need to find a college or university from which they can get their degree. Southern New Hampshire University and the rest are educational pioneers who are broadening the franchise of college degrees to deserving students who approach learning on their own terms. They seem to be outliers now, but decades from now, SNHU, WGU, UW Extension and the others will be the norm. And StraighterLine will be right there with them, supporting students on the path to their college degree with flexible, convenient and affordable self-paced online college courses that fit in perfectly with the competency-based model of education.